Stella Arnaldo's Blogspot: Da who?!?! 1. DA who is this senatoriable who eagerly accepted P2 million just to switch parties? Oh, that, plus all expenses to be paid by his new presidentiable bet said to be teeming w/ cash, courtesy of his ah, relative. Detractors of the senatoriable of course chide him for being "cheap" for accepting the P2M check, which is seen as a rather minimal amount. E kung kelangan ng tao noh?! 2. Da word is this sleepy vice presidentiable is now eagerly negotiating with the dark horse presidentiable bec. the former's backer in his party has now supposedly chosen to support a relative in the presidential race. Earlier the backer was said to be against his relative bec. of the rather offensive behavior of the relative's spouse. Well, blood is thicker than water, ika nga. 3. The real story behind the reported pullout by T.I.M. 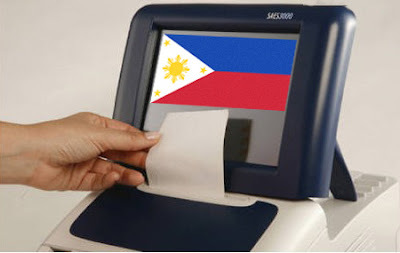 from its consortium w/ Smartmatic, the shady company awarded the contract to automate the 2010 polls, is that despite Smartmatic's 40-percent stake in the project, its executives wanted total control of management and the finances, including the signing of checks. Of course, considering that the background of Smartmatic isn't really credible, T.I.M. officials thought they could be liable for any issues and problems that arise from the project, especially if the gang from Barbados just disappears. Of course, my own conspiracy theory is that this is all is in an elaborate setup to allow Smartmatic to implement its project in joint venture with the Comelec. There's a lot of moolah to be had in that project and someone is going to get mightily rich from allowing it to continue under that kind of partnership agreement. And no, I'm not talking about the gentleman from Malacañang. The person who will benefit from the Comelec-Smartmatic partnership has had questionable and profitable dealings in the past as well. Da who? Guess mo. 4. More on the poll automation project: one of the bidders disqualified from the bidding by Comelec, was said to have not complied w/ the terms of reference of the bid. But da word is, the company took a look at the list of equipment the Comelec wanted and ticked off a few off the list the company felt was not needed in the first place. Entonces, the company was going to save Comelec/we taxpayers a lot more money if the poll body just entertained the company's bid. 5. Da who is this well-known PR guy who has been hired by the embattled Doktora to handle the crisis PR needs of her erstwhile boytoy, who last we heard, now wants to study to be a lawyer? Truly love knows no bounds for the Doktora considering that the PR guy, famous for publishing a book on his former client, has an acceptance fee of not less than P1 million. Acceptance fee palang yan ha? With the tri-media effort the PR guy is implementing to help portray Doktora's boytoy as a poor confused fella who was abused as a child, the tag price for the campaign has been estimated at no less than P5 million by other PR men in the industry. Ang saya naman! Labels: 2010 elections, Comelec, Corruption, gossip, Politicking, poll counting, public relations, Smartmatic, T.I.M.